This is to acknowledge the receipt of your information regarding the delivery of your Approved ATM Card.HOWEVER YOU ARE Welcome to SKYE BANK PLC OF BENIN REPUBLIC ATM CARD PAYMENT CENTER. Once again we note out the email sent in regards to the Activation and delivery of your ATM CARD and subsequent delivery to your Address. Be assured that we do not delay hence our services are absolutely facilitated as will be receiving your ATM master card within 48 hours with assurance and guarantee. We wish to let you know that we have received your address to Deliver your ATM CARD as Reconfirmed Below After Activation ( Fill in your informations in the form attached in the email Below. As matters to your ATM delivering we wish to inform you that all necessary arrangements has been made and your funds of $7.5Million United States Dollars have been credited in an ATM CARD which will allow you to make withdrawal from any ATM machine any where in the world at a Daily Limit of $5000.00 United States Dollars valid Till 29/09/2023. Please Note that we can not Deliver your ATM CARD without Activation since it has been dormant and can not be used by you if not activated.You are advised to pay a ACTIVATION FEE of $285.00 (Two Hundred And Eight Five United State) so that our special ATM AGENT will have it delivered to your address within 48 Hours without any further delay. Pick up Agent name: Gloria Ekwealor with the information below. Amount : . . . . . $285.00 USD. As soon as we receive the payment information such as MTCN, SENDERS NAME and ADDRESS, your ATM CARD will be activated and We will furnish you with your ATM CARD 48 Hours delivery Shipment Details. The information contained in this message is confidential. This message is intended to be read only by the person named above. The unauthorized use, disclosure, copying or alteration of this message is strictly prohibited. If you have received this mail and did not request for it please discard with urgency. 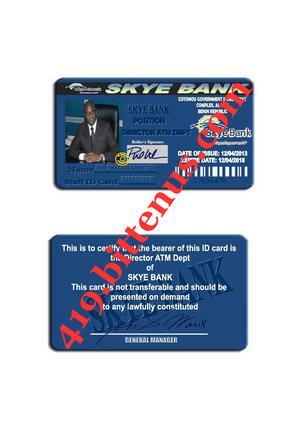 This mail was sent on behalf of ATM CARD Payment in SKYE BANK BENIN code of Conduct.